The Capricorn Astrology Research Project has looked at the Sun’s position by house in the birthcharts of over 20000 public figures and found that celebrities are significantly more likely to be born in the morning than at any other time of day. The sample of 20641 subjects was collected from the Astro-Databank Wiki Project website database of Public Figures between 2010 and 2013, the final list collected between March and May 2013. All the charts on the Public Figures list were used unless there was no birthtime given. In Astrology an emphasis on the left hand ( Sunrise ) side of a chart, particularly if planets are in the first house or close to the Ascendant, indicates a person who is generally self motivated, initiating and assertive with a strong drive to be the centre of attention. Self determination and one’s own path in life are the most important themes. In simple terms the 1st house is the house of the self. A great example of this type of chart is Madonna. 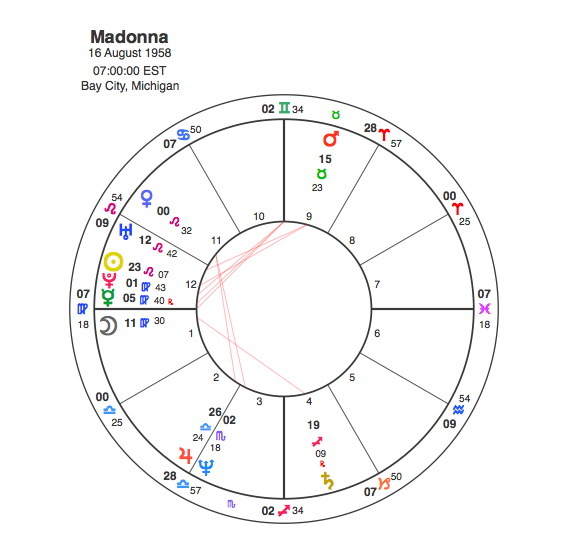 Madonna was born at 7.00 am so the Sun in her chart, shown by the gold circle with the dot in the middle, is on the left just above to the horizon. An emphasis on the right hand ( Sunset ) side of a chart, particularly if planets are in the 7th house or close to the Descendant, indicates a person who is generally concerned with or dependent on other peoples activities and needs in order to pursue their own drives. Cooperation and relationships are the most important themes. In simple terms the 7th house is the house of the marriage partner. 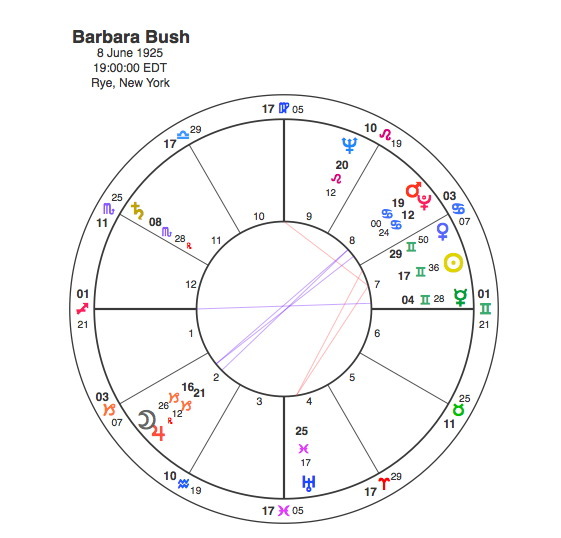 An example of this type of chart is Barbara Bush who is mainly known as the wife and mother of two US Presidents. Barbara was born at 7.00 pm so the Sun in her chart is on the right just above the horizon. There are many astrological factors that make up a birthchart, with a number of planets in different signs and houses and the angular relationship between them. The Sun is the most important single factor and its house position is determined by the Earth’s daily rotation. The Sun is in the Eastern half of the chart after midnight and before noon and it is in the 1st house just before sunrise. The Sun is in the Western half of the chart after noon and before midnight and it is in the 7th house just before sunset. The hypothesis of the Capricorn Astrology Research Project is that people who are recognised public figures are more likely to have the Sun in the Eastern half of the chart and in the 1st house than in the Western half and in the 7th house. This is a staggeringly strong result which shows a clear link between Astrology and human behaviour. 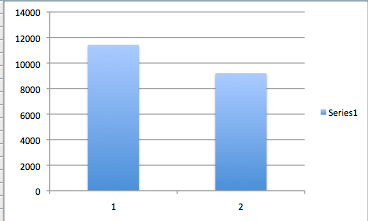 which strongly indicates that the parent population intrinsically has the underlying form that you’ve just identified. I’m not claiming that this is categorically the case, but that this needs to be taken into account for you to get any meaningful result. Indeed, more specifically, what you really should be looking at is the deviation of your sample population from the parent population. This is known as Kolmogorov-Smirnov testing. As an aside, I’d be very aware of trying to use statistics when you don’t seem to understand their use cases and limitations. 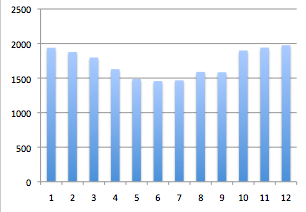 Thank you so much for sending me this evidence of an underlying pattern of births by time of day. You are of course right that if there does exist a tendency for births to be clustered in a certain pattern, that would have an impact on my research. As you say the important thing is the deviation of my sample from the parent population. If we take your example as being the parent population, it shows a strong peak for births occurring around 2 am with a trough at 1 pm. My research has shown that in the charts of 20,000 plus famous people, the peaks occur between the 11th and 1st houses and the strongest showing is in the 12th house. The times of day for the Sun to be in these houses will alter over the course of the year. But as a rule we are talking about a peak occurring between 5 and 10 am with the 12th house mainly focusing on 6 – 9 am. According to your data of US births by hour, these time periods coincide with relatively low scores in the parent population. I’m sure if you were to apply your Kologorov-Smirnov test to my data, you would find that the deviations from the parent data would give my findings an even greater strength than I had previously supposed. As an aside to you, I’d be very aware of making assumptions about other people’s understanding of statistics, particularly when you don’t seem to have taken the trouble to read or perhaps understand their findings. Unfortunately I am used to scientists assuming that anyone who writes about astrology is an idiot, so will not take it personally. I am happy to discuss this further and if you have any more data that relates to the diurnal spread of birth times I would be most grateful if you could send it to me. According to Michel Gauqelin’s research, 10% more than average are born between midnight and noon, while 10% less than average are born between noon and midnight. However, this observation is true only for natural births. When a birth is triggered artificially by hospital staff, the birth time can be any moment. For this reason Michel Gauqelin discriminated between births before and after 1950, when hospitals began to trigger births artificially. Thanks for your comment. It was Michel Gauquelin’s research that inspired me to do mine. He was of course looking at people who had achieved a level of fame in their particular area. I believe my findings fit very well with his, particularly with the focus on the 12th house area of the chart. About 25 – 30 % of my sample were born after 1950. You are right in saying that this was the time when hospitals started to trigger births artificially. However I do not see that birth induction has any relevance. Induction still is not an exact science and it certainly wasn’t in the 1950s. Birth can still occur many hours after induction takes place, so hospitals could not arrange it so that more births occurred in the mid morning. Even if they could that would have meant starting the process in the early hours which is unlikely. The only factor which could go towards explaining my findings would be elected caesarians. It is reasonable to suggest an elected caesarian would be timed for mid morning, certainly rather than the middle of the night. But elected caesarians did not begin to occur until the mid 1970s. Even then they were a very small percentage of overall births. Less than 5 % of my sample were born after the mid 1970s. I appreciate your comment, but hospital interference has no relevant impact on my data. Interesting research. I agree that it would be good to include data on average birthtimes in the normal population. I did a similar experiment a few years ago with regards to the Mars sign of hockey players. I sampled about 4000-5000 hockey players from four different generations, and found that they were 13% likely to have Mars in Leo, but only 5% likely to have Mars in Pisces. That’s matches the astronomical frequencies of Mars orbit very closely. It isn’t a random or even distribution, and you would want to check that first.